Observation - Unknown Caterpillars - UK and Ireland. Description: I have found about 4/5 of these fellas in the roots of plants I was planting up today.This was the biggest one (found in Butcher's Broom roots). Bit of a poor pic, but the caterpillar came straight out the earth.Could it be a Yellow Underwing? I have found about 4/5 of these fellas in the roots of plants I was planting up today.This was the biggest one (found in Butcher's Broom roots). 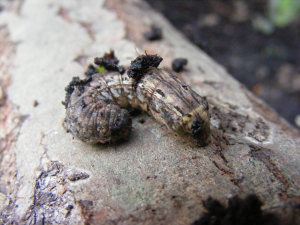 Bit of a poor pic, but the caterpillar came straight out the earth.Could it be a Yellow Underwing?